Pope Francis has called Palestinian leader Mahmoud Abbas an “angel of peace” as the two leaders met in the Vatican. The meeting comes three days after the Vatican officially recognized Palestine as a state. 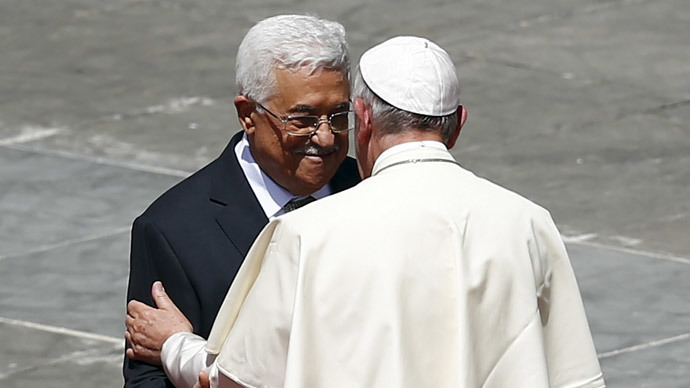 The talks between the Palestinian leader and the pontiff, held behind closed doors, lasted twenty minutes. “During the cordial discussions, great satisfaction was expressed for the accord reached on the text of a comprehensive agreement between the parties on various essential aspects of the life and the activity of the Catholic Church in Palestine, to be signed in the near future,” said a statement from the Vatican, as cited by news.va. Abbas traveled to the Vatican to attend the canonization of four new saints by the Pope, two of whom are Palestinian nuns. The nuns, Marie Alphonsine Ghattas from Jerusalem and Mariam Bawardy from Galilee [now in northern Israel], who lived in Ottoman Palestine in the 19th century, are to become the first Palestinian Arabs to get sainthood. The move to grant them this honor has been described as a "sign of hope" for the region by the Latin patriarch of Jerusalem, Fouad Twal. Abbas’s visit to the Vatican comes three days after the state officially recognized the state of Palestine, following the finalization of a new treaty on Wednesday. The treaty, as yet to be formally signed, says the Vatican has switched its diplomatic allegiance from the Palestinian Liberation Organization to the state of Palestine. In 2012, the Vatican welcomed a decision by the UN General Assembly to recognize Palestine as a non-member observer state. The latest treaty, however, is considered to be the first legal document between the Vatican and the state of Palestine, which can be considered as official diplomatic recognition. According to Vatican Foreign Minister Monsignor Antoine Camilleri, the move was not politically motivated, but simply in line with the Holy See’s position. Israel hit out at the Vatican’s decision, saying it damages prospects for peace in the region. "This move doesn’t promote the peace process and distances the Palestinian leadership from returning to direct and bilateral negotiations," its foreign ministry said in a text message. "Israel will study the agreement and will consider its steps accordingly." The treaty in question concerns the activities of the Catholic Church in Palestine. In April 2014, a Catholic Monastery was vandalized not far from the Israeli capital of Jerusalem in a hate crime carried out by Israelis. Slogans condemning peace talks with Palestine and graffiti disparaging Jesus and Mary were daubed on the walls.